From ancient times Cyprus was called the “island of the sun” because the sun shines for 340 days a year. Its climate is considered one of the healthiest in the world. Infectious diseases are practically unknown. The climate of Cyprus never fails to delight its visitors and every season has a charm and beauty of its own. The sun shines continuously and average yearly temperatures rise to 30° C (86° F) . In the summer months Cyprus is a veritable paradise for holidaymakers offering sandy beaches and clear turquoise waters which beckon swimmers and provide the perfect conditions for sailing, skiing and all water sports under the sun. Yet a complete contrast waits in the cool, pine covered mountains Troodos, with delightful hill resorts and traditional hotels. The Cyprus winter is short and mild, with average daytime temperatures around 16°C. This season brings some much-needed rain to the land, but most of its days are bright and sunny, and there is a short snow season on the mountains from January to March. In the winter the snow covered slopes offer ideal skiing conditions, with fun to be had by all ages from tobogganers to serious skiers. During winter one is able to bask on a sandy beach and within an hour embark on a skiing adventure in the Troodos Mountains. In autumn the scent of ripening fruit and freshly harvested wine grapes wafts through the air. As the land mellows in autumn there is a wonderful clarity of air on those balmy days, still warmed by the brilliant Cyprus sun. The sea temperature is still high after the long hot summer, and for some this is the best season of all. 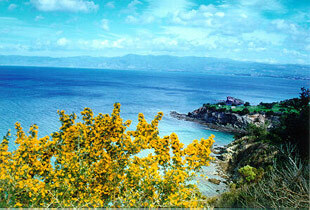 In springtime the island takes on an enchanting beauty. The countryside is set ablaze as glorious wild flowers and fragrant blossoms burst into life to delight the eye with their stunning colors. Bright poppies, yellow daisies and pastel anemones present their myriad colors in the fields. Meanwhile prickly broom and rockroses decorate the hillsides, peonies start appearing on the mountains, and everywhere the heady scent of orange blossom pervades the air. 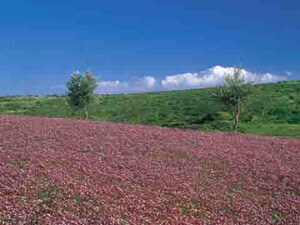 In fact with 1,500 different species of flowers, Cyprus is a paradise for nature lovers. As the days lengthen and the sun gathers strength, Cyprus enters an idyllic season for walks, leisurely picnics and the fascinating contemplation of nature, not forgetting, of course, swimming and sunbathing. From the gentle warmth of early spring lo the golden sun-drenched days of high summer, there's a Cyprus season to suit all types, just as there is a special part in this Island of contrasts to appeal to all tastes. The climate is equable, with an abundance of sunny days throughout the year. The average daytime temperature from June to September is 32oC, from December to February 16oC and the other five monehts 25oC. Very cool, cotton clothes are recommended for the hot summer months. Jackets and light sweaters may be required for the evenings during May and June, September and October, and warm clothes are worn during the winter months. Summer is a season of high temperatures with cloudless skies, but the sea breeze creates a pleasant atmosphere in the coastal areas. Winters are mild with some rain and snow on Troodos Mountains (usually starting before Christmas). In Cyprus there is abundant sunshine, even in December and January, there is an average of six hours of bright sunshine per day.